KONE - Why invest in KONE? The global scale of the business provides stability: KONE is present in the Europe, Middle East and Africa area (42% of sales in 2018), Asia-Pacific (38%) and North America (20%). KONE is one of the leading companies in the industry and has a strong market position especially in the growing Asian markets. 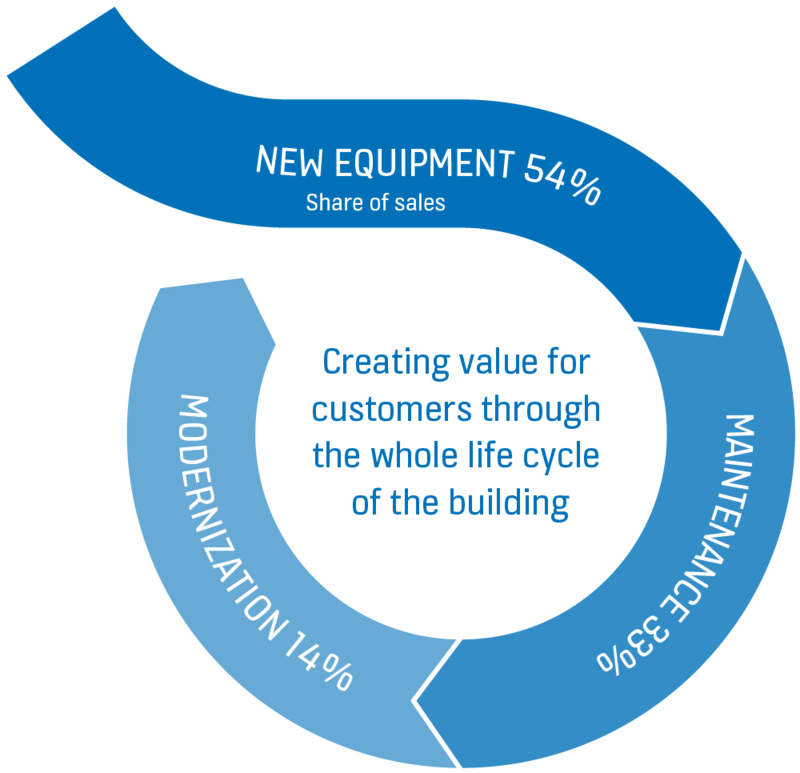 KONE’s business model is to provide solutions for the full lifecycle of equipment, starting from the sale of new equipment, through maintenance and modernization. Strong megatrends supporting new equipment market growth, which feeds into growth of equipment in maintenance. The installed base of elevators and escalators is aging, providing a growing need of equipment modernization. We retain our challenger attitude and develop our competitiveness by continuously looking for new ways to add value for our customers with our services and solutions. We also systematically strive to improve productivity and quality. We are proud of our innovation track record. With over 3,000 patents across our businesses, we consider ourselves the innovation leader in our industry and with our partners, we constantly strengthen this position. KONE’s innovative solutions include breakthrough technologies such as the machine-room-less elevator and a superlight hoisting rope that enables elevator travel of up to 1 kilometer. With constant development of competitiveness, KONE has grown faster than the market. We receive advance and progress payments from our customers across businesses and geographies. This enables us to have negative net working capital and strong cash generation. The cash generative business model has enabled steadily increasing dividends for shareholders. Good profitability combined with our capital light business model enables high return on capital. Comparative figures for 2012 have been restated according to the revised IAS 19 'Employee Benefits'. 3) Excluding one-time items. Including one-time items, basic earnings per share was EUR 1.17 in 2012 and EUR 1.26 in 2011. 4) In addition, KONE has distributed extraordinary dividends, EUR 0.33 for 2009, EUR 0.75 for 2011 and EUR 0.65 for 2012. 2016 board's proposal to the AGM. 5) In September 2017, KONE introduced a new alternative performance measure, adjusted EBIT, to enhance comparability of the business performance between reporting periods during the Accelerate program. Restructuring costs related to the Accelerate program are excluded from the calculation of the adjusted EBIT. *KONE has applied new IFRS 15 and IFRS 9 standards from January 1, 2018 onwards and some of the 2017 financials are restated retrospectively.